An initiative to boost recycling at Cal's fraternity houses had a good start, but will it be sustainable? 80 percent of one frat's waste stream was recyclable. Where does the drunken frat brother leave his empty beer can? At Cal, the answer has traditionally been the trash bin — if not the neighbor's bushes — because almost none of the 31 fraternity houses have been regular recyclers. Yet things have begun to change. A frat house recycling program instituted earlier this semester by a pair of ambitious sorority sisters has put a dent in the load of cans, bottles, and cardboard that Cal's fraternities send to the dump every week. Rebecca Mason and Kelley Doyle, co-founders of the initiative, began the program in February after obtaining grants for recycling bins. To assess their progress, they assumed the heroic duty of emptying unsorted frat-house trash onto the pavement and auditing its contents. They perform this task — or at least monitor dumpster levels — every two weeks at each of the ten currently enrolled fraternities. And after eleven weeks they've seen across-the-board increases in recycling. Theta Delta Chi, one of the first houses to sign on, saw an approximate 15 percent drop in avoidable waste between the program's second and fourth weeks. Similarly, Tau Kappa Epsilon, a house with 26 rooms and forty residents, experienced a 25 percent drop. "It's definitely been pretty successful," said Jordon Hemingway, a third-year environmental engineering student serving as the house's sustainability coordinator. "There's still a little inertia of people not wanting to change their habits, but for the most part it's been doing really well." How Mason, a junior studying psychology and social welfare, and Doyle, a sophomore studying environmental science, came to institute fraternity recycling has more to do with being good stewards of the earth than with policing their partners in the Greek system. 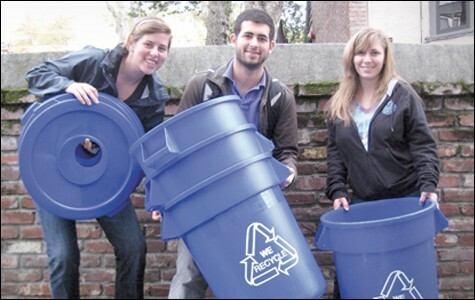 After all, their houses are already in order: All twelve of Cal's sororities have their own recycling programs, and all but two also compost, said Doyle. She and Mason came to the issue of fraternity waste separately, and teamed up when they found common ground. Doyle got the idea while interning for the Associated Students of the University of California, under Director of Environmental Sustainability Jasmine Tuadi. "I think I started picking up on it when I started hanging out with frats," Doyle said. Many of the houses had recycling bins, but were using them for trash. Others had nothing at all. "It's kind of ridiculous that they just generate all these cans and a lot of paper, too, and it just gets thrown out," she said. "I was really frustrated about it and wanted to make some changes." Mason also was in the midst of a sustainability-centered internship when she embarked upon her mission to green the Greeks. Working with Berkeley City Councilman Gordon Wozniak last summer, she took the reigns of the initiative. She was awarded a $2,500 grant from StopWaste.org in July, then received matching funds from the Berkeley City Council. She used the start-up money to purchase the initial set of supplies — two twenty-gallon recycling bins for each floor of every house and one 28-quart bin for each room. If all of the first ten houses show a 20 to 30 percent decrease in avoidable waste by the end of the semester in mid-May, she's liable to receive more funding to help outfit the remaining fraternities. "There's such a huge amount of waste created in the Greek community that is completely unnecessary," Mason said. "It's really hard for me to see cans and bottles thrown out instead of recycled." Not that the challenge was entirely new to her; at her former high school in Irving, California, Mason established a recycling program for waste generated on campus. Delta Chi was the first fraternity she worked with at Cal. Both of its first two audits showed avoidable waste levels at 80 percent, the highest numbers of any house so far. Nick Cash, a freshman environmental sciences major who has assumed responsibility for the program, believes they can do better. "I'm trying to breed a house of environmental prodigies," he said. He and a few housemates recently redeemed a couple thousand aluminum cans. They earned about $70, which Cash said they'll pump back into eco-friendly initiatives such as low-flow water fixtures and energy-efficient lighting. Tau Kappa Epsilon did the same and earned about $250 for its first month of collected cans, thanks to a big party that "generated quite a bit," Hemingway said. As successes trickle in, significant obstacles still loom on the horizon. The plastic "keg cups" that are ubiquitous at college parties, for one, are not easily recyclable. Some companies will accept the cups in commercial quantities, and Mason is investigating the possibility of organizing campus-wide collections. Worse yet is the threat of attrition. Without anyone assuming responsibility for the initiative next year — both at the organizational level and within each house — it could die over the summer. An earlier effort called Greening the Greeks suffered just such a fate, although Mason and Doyle have begun to revive it. The final challenge may be the toughest to manage, especially with huge year-end parties just around the corner. 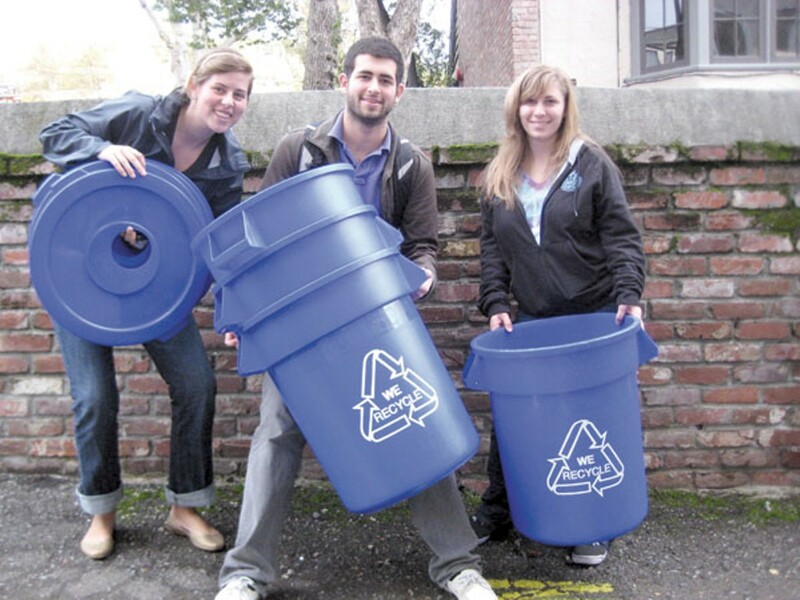 City of Berkeley recycling program manager Andy Schneider, who assisted Mason in purchasing the bins, is optimistic about the fraternities' follow-through, but not delusional: "I think that they're set up for success, and we'll see," he said. "Recycling kinda goes downhill after midnight."